Marushima your favorite source Hiroshima grew up (domestic vegetables and fruits used) 500g by Marushima at Sunset Succulent Society. Hurry! Limited time offer. Offer valid only while supplies last. 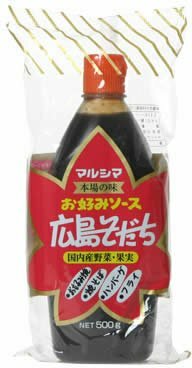 Item description ''Marushima your favorite source Hiroshima grew up (domestic vegetables and fruits used) 500g'' is, was born in the home of Hiroshima. Item description "Marushima your favorite source Hiroshima grew up (domestic vegetables and fruits used) 500g" is, was born in the home of Hiroshima. Crowded dissolved whole vegetables and fruits of domestic, has been living natural flavor is as it is, taste, preeminent of your favorite source with flavor. Because mild source, okonomiyaki is, of course, fried noodles, hamburger, fries, salad, such as each city taste of curry, available in a variety of dishes. Chemical seasoning, food additives non-use of preservatives, and the like. Of raw materials, vegetables, fruit, soy sauce and starch, genetically modified raw materials are not used. 500g filled. Caution After opening on the storage should be stored in a refrigerator (10 degrees or less more than once). How to Save Avoid direct sunlight, store at room temperature. If you have any questions about this product by Marushima, contact us by completing and submitting the form below. If you are looking for a specif part number, please include it with your message.